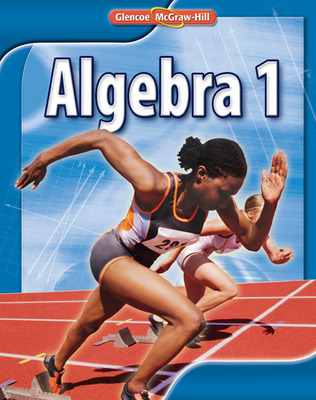 Glencoe Algebra I delivers the depth of content required to meet the new changes in your state’s standards; provides relevant applications for teens; unique instructional resources for teachers; and is available in print, online, and on CD-ROM or DVD formats. Engaging, high interest applications in every lesson bring mathematics to life for teens. Motivating Real-World Problem-Solving Graphic Novels include a variety of teen-relevant problem solving stories in a graphic novel format. Hand-On Labs and Graphing Technology Labs promote active learning. Supports all learners by using Math in Motion Animations, Interactive Labs, and BrainPOP® videos to visually and dynamically demonstrate mathematical content; have students use the Personal Tutor videos for every example when additional understanding is required; and provide students with free access to step-by-step exercise solutions at Hotmath.com. Addresses different learning styles with our use of Multiple Representations in key concepts and in exercises specifically written to require the use of multiple representations for their solution. Involve students in higher order thinking situations with our exclusive set of H.O.T. Problems found in every set of Practice and Problem Solving Exercises. Helps students who may be performing two or more years below grade level with Math Triumphs - Foundations for Algebra 1, a unique resource for Tier 3 Response to Intervention (RtI) needs.